I LOVE these Epic Character Inspired Art for ONLY $3.27 (Retail $10)! I have ordered some prints from this company before and have LOVED them - super sturdy and look great in a frame on my wall! Attention all book, movie, game and pop culture lovers: The reviews are in and these are so loved! The perfect modern and transitional decor for those hard to accessorize theme rooms you've been wanting to update! Our artworks will rescue those walls and make them pop! 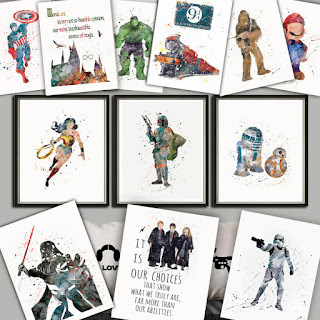 Our epic and loved collection of character inspired art is done in a rustic and loosely impressionistic &amp; splatter watercolor style. You will L-O-V-E these prints!